It surprised me to discover that persimmons perform spectacularly in the oven, turning all maple-custardy inside. Last week I roasted some fuyu persimmons, red onions, and brussels sprouts, and took them to the Obama potluck garnished with toasted walnuts and drizzled with maple syrup. I was so happy when Virginia and Indiana were colored blue on the map -- both states in which I have registered to vote, but never thought it would matter. Obama hangs out with Alice Waters, said the farmer Waters shops from. San Francisco erupted into spontaneous street parties. I biked between joyfully honking cars on Market Street, and threaded my way through the crowds on Castro, where a bit of anxiety tempered everyone's glee. California's Proposition 8 passed. What a piece of hate-legislation it is: using the state constitution to tell some people they can't marry. Tonight I spooned super-ripe peeled fuyu persimmons into delicata halves with minced shallots, raisins, and butter, and baked them up till quite tender at 425. And then I had cornbread crumbled in my lentil soup. 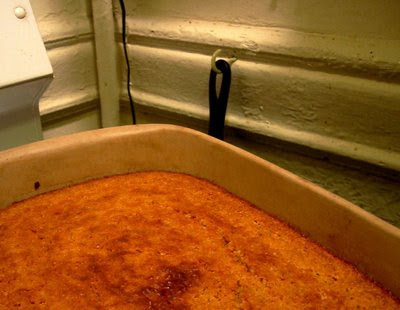 I made Sally Fallon's yogurt-fermented cornbread from Nourishing Traditions, which was light, gold-crusted, nubbly, and deeply corn-y. To roast persimmons: select ripe-orange, almost-tender fuyu persimmons. Rinse them and pluck out their gorgeously symmetric leaf-tops with your thumb. Slice them in eighths and pick out any pits. Arrange them on a buttered baking sheet, sprinkle with salt, and roast at 400 till golden on the underside -- twenty minutes or so -- and flip them. Continue baking till uniformly golden, crisp on the outside and very tender on the inside. Toss with other roasted or cooked vegetables, or eat plain with butter. I'm surprised you didn't treat us with some yummy Turkey-day recipes. Some of us look to girls like you for culinary guidance around the holidays. 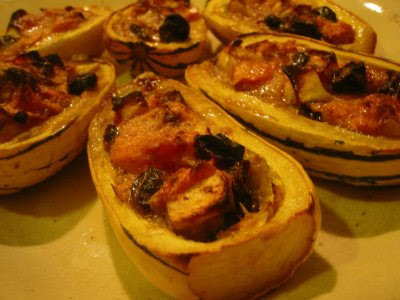 So I had some delicata squash lying around along with persimmons, and typed in recipes for it and you were the first one on the google list! Yum. I'm on my way home to make this for dinner. Your blog is beautiful. I hope you're doing well!